Takeaway: There may be no more useful, and unexpected, item to add to your cannabis kit than oven bags. They're thick, they kill smells, and they can be made airtight. What would you say if someone told you that a turkey bag is a must-have item for anyone looking to store cannabis, either during the curing process or after? Not only that, but that they are great for large quantities like those produced by cannabis farms, and for smaller quantities, like those processed by home growers, or stored by users. It sounds far-fetched to think about oven bags, like those available from companies like True Liberty, sitting alongside rolling papers, trimming shears, grinders and Ziploc-style bags. Oven bags, known commonly as turkey bags, can be used at nearly every step of the cannabis production process after the plants have grown and produced their buds. These extra-thick bags can be used to: cure, store over long periods, decarb for edibles, keep stored weed from stinking up your home, and to more safely and covertly transport your cannabis from place to place. Oven bags are especially useful after your buds have been trimmed from the plants, but before they’re ready to be smoked. In curing, you generally want to let your trimmed cannabis sit for anywhere from two to eight weeks in an airtight container, opening every so often to burp your nugs to prevent mold and bacteria from ruining your harvest during the curing process. These bags offer a practical alternative to more expensive curing storage solutions like glass. This is especially true for larger quantities, where True Liberty’s larger bags can be a great cost saver. The biggest complaint many people have around making their own cannabis edibles is the smell associated with the decarboxylation process. For those who might not be aware, decarboxylation, or decarbing, is the process that heats the buds (generally in an oven) until they reach a temperature that releases the chemicals that give edibles their desired kick. As you might imagine, the smell of heating multiple grams of cannabis at the same time is potent, and not at all suited to sharing a home (or building) with others - or with making edibles discreetly. Oven bags, which were originally designed to keep moisture from escaping, are also surprisingly effective at eliminating the smell of decarbing cannabis from a potent and lingering issue down to a noticeable, but easily removed, nuisance. Able to withstand temperatures as high as 400 degrees fahrenheit, the temperatures needed to decarb pose no danger of damage or leeching from the BPA free nylon. Proper storage of marijuana goes further than just keeping your stash in a BPA free nylon baggie and tossing it in a drawer. Not only can a good strain of weed spread its scent directly through the flimsy and porous BPA free nylon to stink up your spaces, but that same porous nature can dry your buds out over time. Somewhat unsurprisingly, the bags that campers use to keep food smells from attracting hungry bears are also extremely effective at keeping weed smells from attracting unwanted attention. They are also useful in case “is that skunk I smell?”, isn’t the scent profile you’re aiming for in your living space. For storage of cannabis over the long term there is no better solution, to both preserve the bud’s freshness and to prevent unwanted smells, than to add a vacuum packer to the oven bag before you tuck the weed into storage. If you decide to freeze your harvest, for example, vacuum packing is your best option. While there are a number of generic solutions that may or may not do the job, it can’t hurt to take a look at your oven bags’ manufacturers to see if they provide or recommend a compatible vacuum sealer. 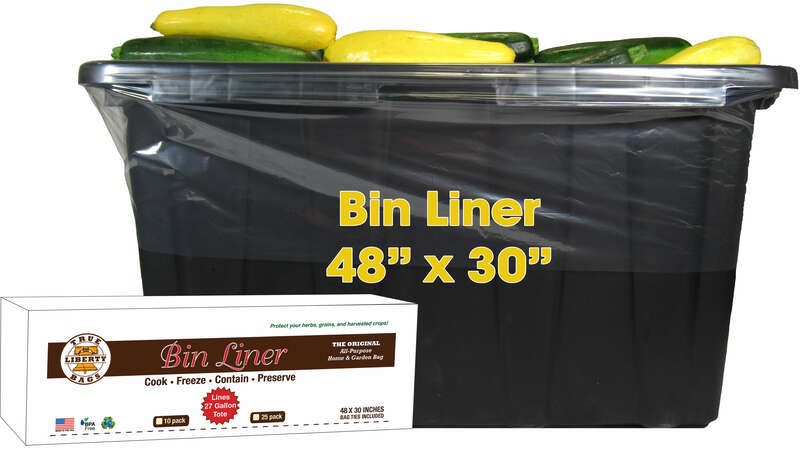 True Liberty Bin liners are great for storing harvested veggies - and your cannabis crop. Have you ever had a moment of panic walking past other humans while carrying your stash? Just because you can’t smell it, doesn’t necessarily mean that the people around you can’t. Solution? Take whatever it is that you’re carrying your cannabis in, most likely a Ziplock-style bag that does less than you’d want it to to hide smells, and throw it into an oven bag. Seal it, and you’re good to go. No fuss, no judgmental looks from strangers. While they might not be anyone’s first thought, oven bags aren't just for cooking turkeys. These bags really can be a useful tool for cannabis businesses, growers, aficionados, and even first time users. They remove some of the worst-offending smells associated with cannabis, are resistant to some pretty severe temperatures and can even be used in the curing process. Overall, traditional oven bags can be a pretty robust tool for growers at all levels.